The Meadows 6 inch steel burr mill is an excellent option for customers who desire to grind products with oil content and/or high moisture content. The Meadows 6 inch steel burr mill is designed to grind wet, oily, or dry products to a medium to course grind. Some of these products include: wheat, corn, oats, barley, spelt, peanuts, cashews, almonds, walnuts, pecans, sunflower seed, dried peppers, dried vegetables, soybeans, coffee beans, ginger root, coconut, dried fruits, spices, herbs, and much more. 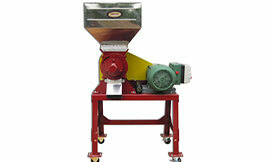 The 6 inch steel burr mill operates quickly delivering bushels of consistently ground product in record time. Each 6 inch steel burr mill is equipped with a food-grade one bushel stainless steel hopper with an easy to use feed-regulating slide. The mill housing is made from precision grade, laser cut steel. Inside the housing a powerful cast steel auger pushes material to a set of 6 inch diameter cast steel burrs, one burr fixed and one burr rotating. The 6 inch steel burr mill is operated with a UL and CSA approved 5-hp electric motor. The electric motor is available in either 60-hertz single-phase or 60-hertz 3-phase. The electric motor is also available in 50-hertz. The electric motor is controlled by a simple, dependable magnetic motor starter. Motor power is delivered to the steel burr mill by an easy to service pulley system that delivers maximum torque under load for highest efficiency. The cold-finished 1018-grade shaft spins on a pair of two-bolt flange bearings with bronzeoil bushings. Burr adjustment is accomplished with the knurled adjustment knob. After the proper texture is set the knurled locking knob keeps the grind consistent from start to finish. As with all Meadows products minimum maintenance is required. All maintenance can be accomplished with normal hand tools. For changing from one product to another, the 6 inch steel burr mill can be disassembled, cleaned, and reassembled in only a few minutes. Each 6 inch steel burr mill is delivered with a heavy-gauge welded steel foundation. Legs and casters are optional.